Use Crafco’s line of asphalt pavement sealers to provide the BEST protection and a fresh, new look your pavement deserves. When it comes to pavement preservation, an often-overlooked piece of the puzzle is periodic preventive care. A vital element to such preventive care throughout the service life of a pavement surface — for driveways, parking lots, residential streets and more — is sealcoating. By offering a variety of quality sealer products, Crafco can help protect and beautify your pavement. Combined with our other proven preservation programs, such as crack sealing, sealcoating will considerably increase the quality and longevity of an asphalt-pavement surface. An ongoing preventive plan of sealer re-application every 3-6 years will keep your surface looking and performing great for decades. Sealcoating with Crafco’s asphalt pavement sealer products protects pavement from water, oil, fuel, UV rays, de-icing salts, and other harmful elements that can rapidly degrade its surface. Protection from these dangers preserves the integrity of asphalt binder, which prevents key components from breaking down and helps to preserve the pavement base. It’s best to begin a sealer strategy at the start of a pavement’s life, but starting the sealer process even years after a surface is applied is hugely beneficial. Sealcoating with Crafco’s asphalt pavement sealer products restores that rich, black color we all love to see on asphalt surfaces. It enhances the visual appearance of parking lots and driveways, thus increasing the value of one’s property and resonating with drivers, customers, and others. By preserving the quality of your pavement with periodic sealcoating, the need for major repair options, such as asphalt overlays, is reduced, if not eliminated. When you appropriately seal your surface, it will pay for itself exponentially over the life of your pavement. 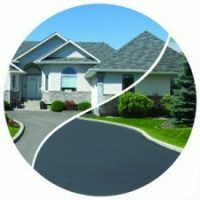 According to the Pavement Coatings Technology Council, homeowners can save $8,000 on an 18-foot by 30-foot driveway with regularly scheduled sealcoating. Crafco offers a comprehensive lineup of sealers to meet your every need. From our selection of proven and trusted refined tar sealers to our innovative LP sealers, we can deliver the right product for any job. Check out our diverse collection of both classic and premium solutions and find which work best for you. Which Pavement Sealer Level of Grade do you Need? Which Pavement Sealer Form Meets your Needs? Crafco also offers asphalt emulsion pavement sealers. OverKote® is available in Sacramento, CA, and Armor Seal A-100 is available in Portland, OR. With our Crafco Pavement Preservation Supply Centers strategically located across the country, we have you covered. If you want Action Pave, we will find a way to serve you. Click here to register for our special Sealcoating Support Toolbox, which offers an email marketing campaign template, social media tips, affiliation banners, and more.